The question is, are these a dessert or a healthy snack? Don’t you love it when you have that problem? Do I eat this as a morning snack at…umm..9:00 a.m. (I eat my breakfast early, okay?) when I know it’s impossible for me to make it another three hours until lunch? Or do I count this as an after-dinner dessert, because, let’s face it, anything with chocolate in the name could and should be considered a dessert. Well, I’ve got some great news, because no decision making is needed for this one — it works as both healthy snack and healthy scrumptious dessert! Yippee! Even as a dietitian, my diet isn’t perfect (shocking, I know). But just like I encourage my clients to do, I’m constantly and slowly making improvements in my diet, little by little changing small, seemingly inconsequential things, to lead to an even better lifestyle. If you would have told my sugar-loaded-cereal-and-NutriGrain-Bar-loving college self that I would be eating mostly unsweetened cereal, opting for plain Greek yogurt, and second guessing even the “healthiest” granola bars 5+ years later, I would have said you were kidding. But that’s just it — it took me five plus years to get to the point I am today so it didn’t feel like I was sacrificing. My point being, there’s always room for improvement, but it doesn’t (and shouldn’t) happen all at once. 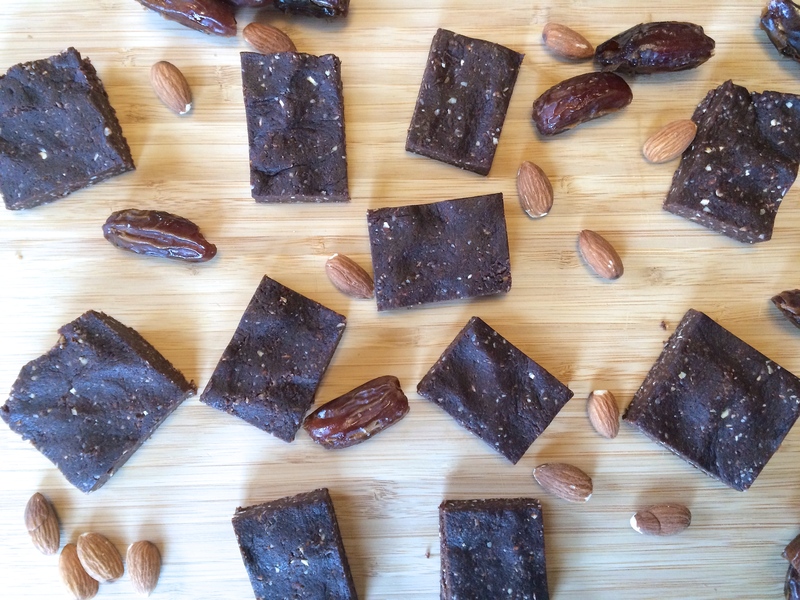 And sometimes you don’t even have to sacrifice that much…enter in my Copycat LaraBar Chocolate Brownie Granola Bars. You guys, these bars are it. Philip is my “normal person” taste-tester and he eats them as eagerly as I do. 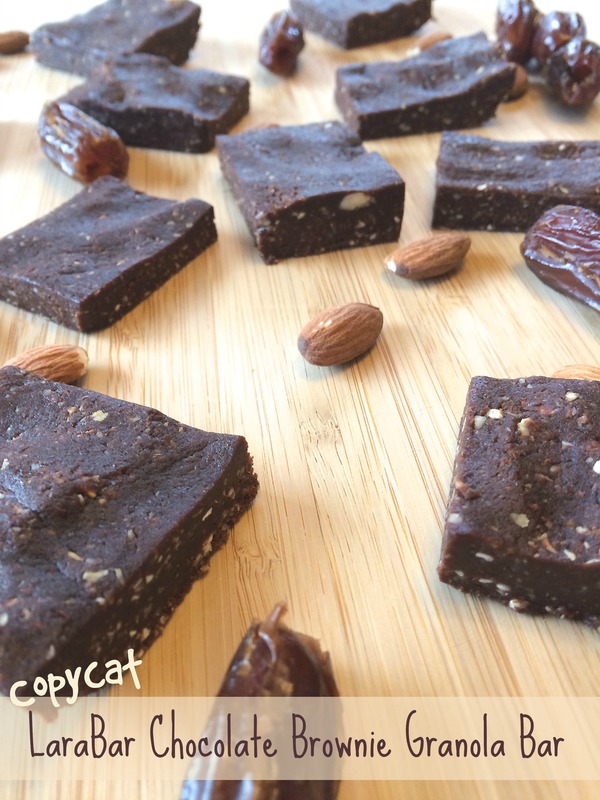 It seriously tastes like a soft, chewy brownie, sweetened only with dates. I know, I know, you’re thinking, “Dates, Kara? !“ Yes, dates! In my opinion, they’re the best natural sweetener for bars like these. If you’re not familiar with LaraBars, they’re pretty much amazing. And you know what their first ingredient is on the ingredient list? DATES! Ahem…sorry for the yelling. The ingredient list on LaraBars is seriously just as short as this one (sometimes even shorter) with about 5 ingredients in each bar. The only problem is they can be quite expensive and sometimes they can be a little bit on the firm side if they’re not fresh. 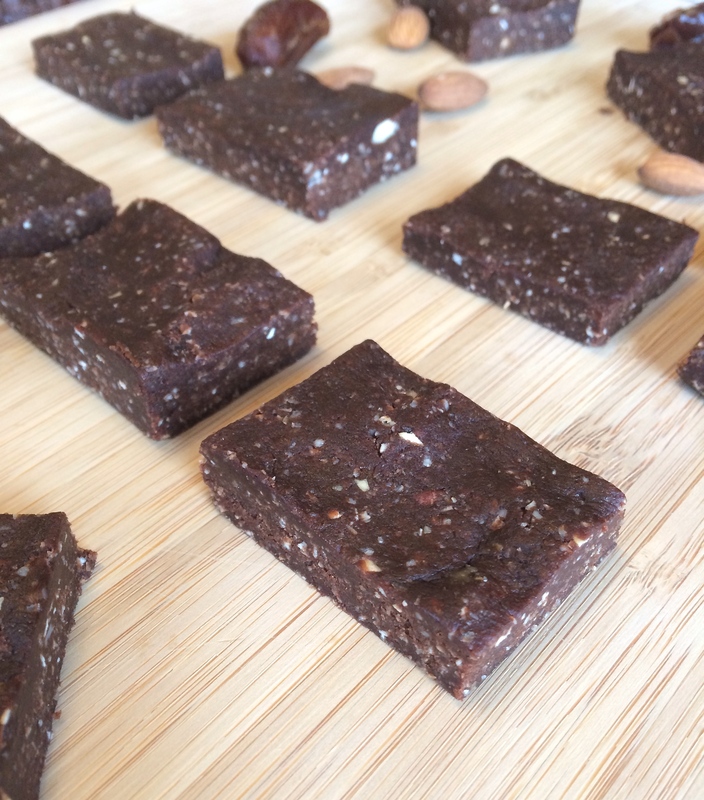 Which is why I love these Copycat LaraBars so much — they’re cheaper (don’t think I didn’t calculate out every ingredient to do a cost comparison) and they just taste so much better, in my opinion. They keep great stored in the freezer and can be eaten straight from the freezer or left out to “thaw” at room temperature for a short time; in a couple minutes, they’re as soft as ever. 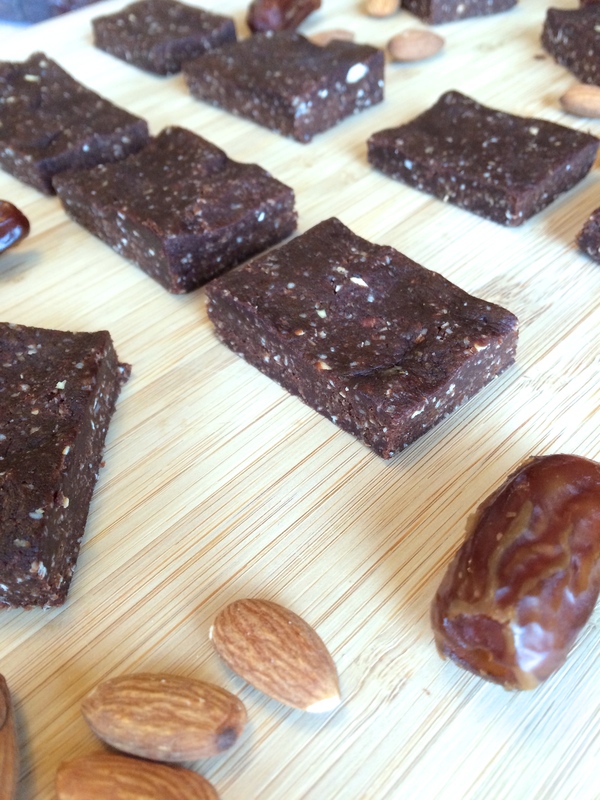 So, are you in need of an afternoon snack that actually fills you up with all the fiber and protein loaded into these? Or maybe just looking for a healthier dessert choice without the sacrifice? I’m telling ya, you need to whip these up today. Make a small change with these granola bars — who knows what change it’ll lead to next. Line an 8×8-inch baking dish with parchment paper so that the paper hangs out the sides; set aside. Place dates in a bowl and cover with hot water. Let sit 10 minutes, then drain. In the bowl of a food processor fitted with a steel blade, add the dates and pulse few times until they begin to form a sticky paste, about 8-10 pulses. Add chopped walnuts and process until mixture forms a sticky ball that begins to pull away from the sides of the bowl, stopping once or twice to scrape down the bowl as needed. Add in the almonds and pulse until thoroughly mixed, scraping down the sides of the bowl as needed. Add cocoa powder, peanut butter, vanilla, and honey (if using). Process until mixture forms a smooth, shiny ball, about 2 minutes, stopping to scrape down the bowl a few times as needed. Add oats and pulse again, until evenly combined. Transfer mixture to the 8×8-inch dish. Press mixture into an even layer with fingers or spatula, whichever works best. Place pan in the freezer for 10 to 20 minutes to set. Once bars have firmed, use parchment paper to lift the bars from the pan. 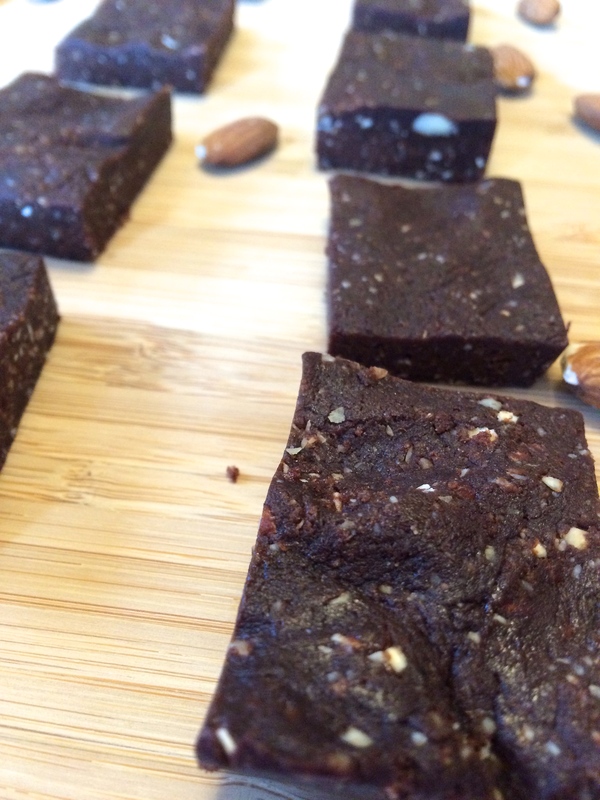 Transfer to a cutting board, slice into bars, and serve. Store leftover granola bars in an airtight container in the refrigerator or freezer. On a completely unrelated note, have you ever heard a song, instantly fall in love with it, and then can’t get enough of it no matter how much you listen to it? Well, that just happened to me this week with Stitches by Shawn Mendes. Luckily for Philip, I’ve only been playing it on repeat while running with my earbuds in. I’ve signed up for some more races again this spring and summer and training is kicking into full gear now. And this song. It. pumps. me. up. Seriously, minutes (okay, maybe only seconds) are being shaved off my times and energy is sky rocketing all because of this song — and well, perhaps a few other tweaks I’ve been working hard on over the winter months have something to do with it, too. But, the song is helping. The beat is solely what gets me (not so much the lyrics — or the music video for that matter). If you’re looking for a new song to add to your workout playlist, this may be it — take a listen! Yum, those look great! Can’t wait to try them! Thanks, Emily! :) I hope you like them as much as Philip and I do!